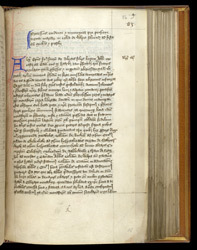 A history of the monastery of Bury St Edmunds, the account to which this page belongs, was compiled by brother Andrew Aston, from various sources, in 1426. This manuscript has a collection of several similar histories. The plain, relatively undecorated page indicates that this manuscript was made as a document or for study rather than for display to important guests or use in situations where impressiveness was called for. Not all medieval manuscripts were conspicuously beautiful.